When I first picked up an ukulele over a decade ago, I didn’t know how to learn an instrument, didn’t have a plan, didn’t have any guidance, so my interest waned and my ukes became decorations. Last October I picked up the ukulele again, and now, nine months later, I’m getting better and better, in good part thanks to the system I’ve developed for keeping my practices fresh and interesting. Update (26-AUG-2014): Though there’s still plenty to be said about my system as describe here, I’ve distilled a simpler version in Revisiting how to practice the ukulele. I’ve been touring and teaching across the country for years now, and I hit all of the major ukulele festivals and club meetings on the way. I get to see the same people year after year, and the thing I see is, most of them don’t really get any better. No matter which of my classes they take, and many take the same one again and again each year, most just stick with the one basic up-down strum, with the same basic chords, in the same keys, all the time. If they’d only take five minutes every practice to work on some technique, like finger rolls or triplet strums, then in a couple weeks they’d have a whole new way to liven-up their playing! I keep a list posted on the wall where I practice. When I find something new, a new technique or riff, I add it to the list. Then I practice the first item on the list for five minutes at the beginning of every session. In a couple of weeks, when I’m comfortable with the technique, I cross it off. In that way every few weeks I’ve got yet another tool in my toolbox. The thing is, the people who come to my classes, most are basically just paying to watch a professional demonstrate what all these techniques and styles look like. They don’t practice them, so they don’t learn them, and the next time I see them, they’re still just up-down strumming. It’s great to keep learning new songs, but take the first five minutes of every session and practice a new technique before moving on to your song list. You’d be surprised how quickly your versatility will grow. It’s probably the best ukulele advice I’d received, and since then I’ve been determined not to be another one of those one-key, “up-down strummers” the next time he comes to town. Then later I got the chance to visit an auntie who’d started the ukulele the same time as me (with the same group) a decade ago. The only difference was she’d kept up with the practices since then. I asked her to play me something, but she said she couldn’t, because she didn’t have her songs sheets with her! Ten years of playing, with a band that had a regular set list, and she hadn’t memorized a single song! I knew that I didn’t want to be like that in ten years. I didn’t want to be forever shackled to a song book just to make music. So I had some work to do. My goal has always been to play the ukulele well enough for friends and family. To pull out an uke and just play a variety of songs without any notes or song books. To be a little better than just up-down-up-down-up-down. So how to make sure my practices led me there? I wanted to really commit regular practice, so I set my sights on an hour each day for five days a week. As per the advice above, my practices needed to be a combination of exercises and songs. I needed a way to balance learning new material with reinforcing older material. Learning all new material every sessions means I’d just forget most of it, doing the same material over and over wouldn’t give me enough of a repertoire to play for long periods. I wanted to be good enough to play anything I practiced without notes. I wanted an easy way to keep track of my progress, as well as all of the techniques I found interesting, or songs I wanted to learn. The system must be portable, analog, and offline. I hate practicing in front of a computer; I want to be able to practice while camping or on the beach if necessary. I decided what I really wanted wasn’t a set-in-stone practice progression to my goal, but something more flexible and randomized to keep it interesting. Develop and maintain a backlog of songs and exercises that I want to learn and practice. Each “round” randomly select a set number of items to practice. For every practice session in a round, follow the practice plan. After a set number of practice sessions, declare the round complete and add a “tally mark” to each of the items I practiced. For the next round, I randomly select a new set of items to practice, making sure I have a spread of items with no tally marks (never practiced) to lots of tally marks (practiced plenty). Sound complicated? Here’s how it worked out in practice. Then on the frontside of the “Current Practice Plan” card I wrote a big “DONE!”. You’ll see why later. I’ll use six cards as dividers in the stack, and so looped them all onto the binder ring. Then I started by creating the backlog. For each song I wanted to learn, I used the pen to write its title onto the front of a card. Then on the back, I wrote “Song”. I did the same for any techniques I wanted to learn, with the name on the front and the word “Exercise” on the back. 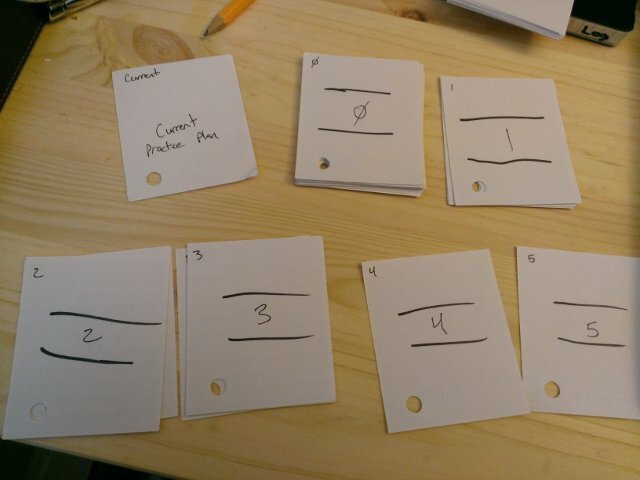 For example, I created cards like “Practice Scales” or “Waltz Strum”. If you want, you can also add little tidbits of metadata about the item to help you. For example, and songs or exercises that were Hawaiian I marked with Hawai’i on the front and back. My entire backlog, where you’re looking at the side that just says “Song” or “Exercise”. Next it was time to decide on the parameters of my practice plans. I chose a round of ten practice sessions, or about two weeks real time. I decided on ten five minute items per practice, giving me fifty minutes per session, with some slack for warm up and mistakes. Five minutes may not sound like much, but when I say five minutes, I mean five solid minutes. If the item is “Waltz Strum”, then I literally won’t stop strumming for five whole minutes. The first practice plan was pretty easy. I simply took the backlog of “0” cards, and drew out ten at random. Okay, maybe not exactly at random, I picked ones that I was already working on, to make the transition smoother. I decided to have half exercises and half songs. 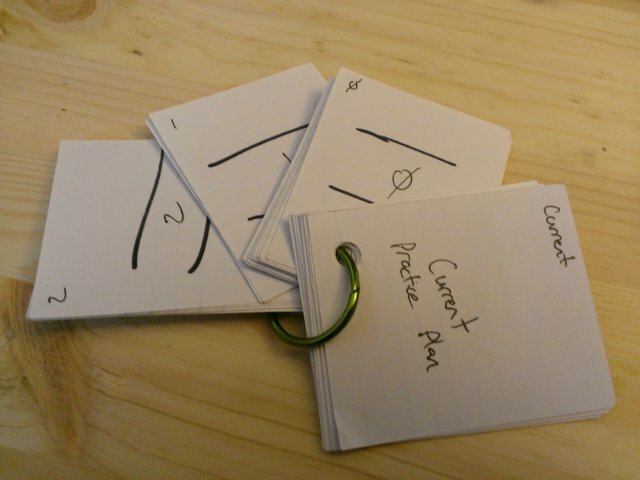 Then I took those ten cards and put them on the ring between “Current Practice Plan” and “0”. The ten items I chose, again looking at the side of “Song” or “Exercise”. The rest of my backlog, again looking at the side of “Song” or “Exercise”. So now, flip the deck over, and flip through the front sides until you get to the “0” card. Flip one more time, and I’m looking at the first item for me to practice. Now it’s time to practice! Or first, a detour about the notebook. 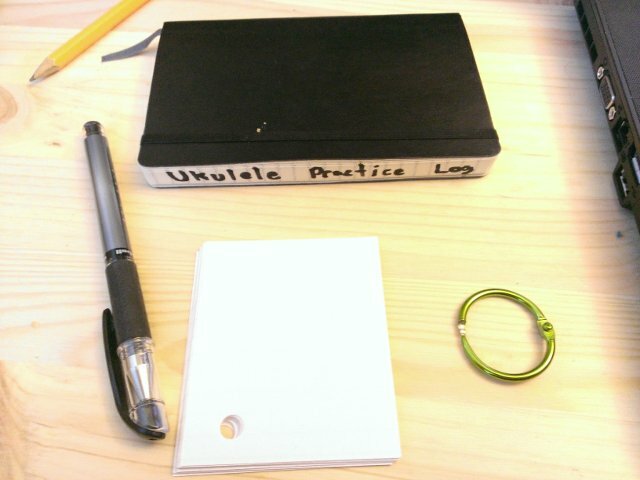 In my notebook, labeled “Ukulele Practice Log”, I mark every time I practice, how long it was, and anything of note. I also mark when I spend any significant time noodling, just so I don’t feel bad when I think that I haven’t practiced in a while. I also make a copy of the current round’s items just for safe keeping. 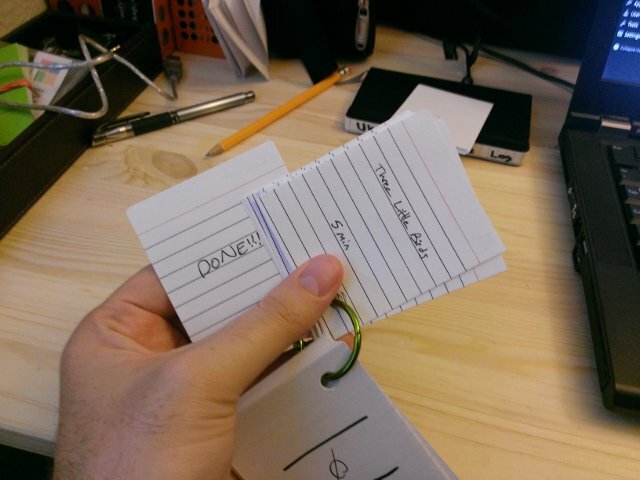 With the order of cards before me, I copy the list of items into the notebook and label it round one. Now it’s time to practice! 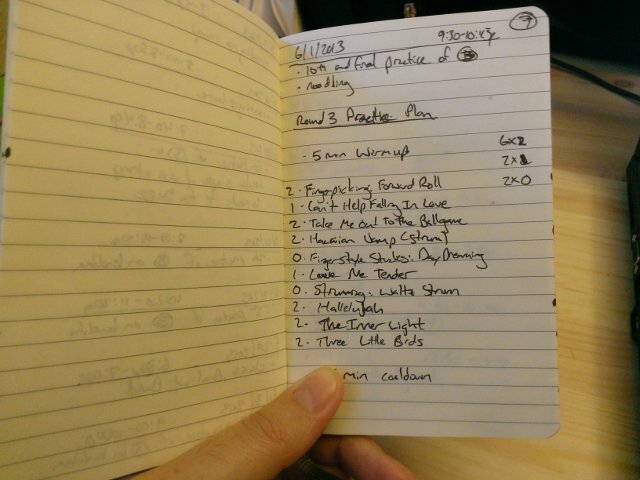 I mark in the notebook that I practiced the round, and repeat every day when I practice. After ten sessions, it’s time to start a new round! First, I take the all ten of last round’s cards, and on the back (the side that says “Song” or “Exercise”) I add a tally mark in the upper corner. I’m on round 2, so I take eight random cards from the last practice (they have one tally) and two random cards from the backlog (that have no tallies). I try to keep it balanced still with half exercises and half songs. The ten items I chose, eight one-tally and two zero-tally. The rest of my zero-tally backlog. The two one-tally cards from the last practice. Now we just repeat ourselves. I write the new practice plan into my notebook, and start practicing. After ten practice sessions, it’s time for a new round, so I add another tally to the back of each card, and shuffle them back onto the ring. Now I have eight two-tally cards, four one-tally cards, and my backlog. I look to round three on the table, and draw out six two-tally cards, two one-tally cards, and two zero-tally cards. If you watch the progression, you’ll see that each round we’re adding a little more of something new, while still remembering to practice the things we practiced before. As each round passes, you’re building up a living record of what you know, and how long you’ve practiced each. The number of cards in each group of tallies will grow, though subtly pushing all cards into the coveted five-tally group. Think about it: with my starting parameters, every card in the five-tally group was practiced at least two hundred and fifty minutes each, or over four hours of solid practice. Could you have practiced a single song for four straight hours with no breaks, no switching to something else? The table was designed so that each round you should have enough cards in each group to satisfy what that round requires. But that will only get you through round six. Starting in round six, you’ll use the same distribution of tally-marks in each round, but even though the distribution is the same, because you keep adding tallies to the cards, the actual practice plans will keep changing. But all those cards moving up the ranks have now created a problem. Rounds seven and beyond still need two new zero-tallies to meet the table’s requirements. Here’s where maintaining the backlog comes into play. To get through round six, you needed to start with at least twenty cards in the backlog. But independent of your practicing, you need to keep on adding new cards! Every song you find you want to learn, every technique you hear about, add a new card. That way you’ll never bottom out when it’s time to create a new practice plan for the next round. The system is pretty flexible, so you’re free to customize it to suit your own parameters. Two weeks too long for a round? Make it fifteen sessions over three weeks. Five minutes per item too short? Make them ten minutes long for a two-hour practice. Ok, the system looks all great on screen. But does it really work? Well, I’m on round four now, and pretty much everything works as planned- except for the round length. I still keep to ten practices per round, but sometimes my round stretches out over three weeks rather than two. Also I don’t always sit down with the intent to do an actual practice session, some times I just noodle around and experiment in order to relax. I find it a joy to add cards to my backlog, know that I won’t forget about all of the cool techniques or songs I find online. I’ve also tested the portability of my system, throwing everything into a gig bag with an uke and taking it camping and it works out just fine. As for the randomization, sure, sometimes I draw a card that I’m just sick of at the moment, so I draw again. Remember, ukulele is supposed to be fun! Also note that this system, while I designed it to help me get better at ukulele playing, could probably be used to learn other skill sets. I imagine it’d work pretty well as guidance for an exercise regimen. Whether or not you use my system, I hope I gave you some ideas on how to maximize your training sessions. I’m definitely interested in how any of you organize your own practices. Be sure to leave any comments below!